My encounter last month with Valleywag over avant garde playright and director Brecht resonated enough in the blogosphere so as to make this site the top result now for the query "seth brecht" or "brecht seth." And so thanks to some kind Attention alchemy, I have become an authority on the subject of Brecht (at least among Seths) in the eyes of the great Pagerank algorithm. 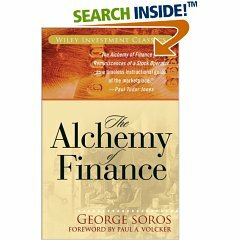 While this doesn't belong up there with Soros' "Real Time Experiment" in the Alchemy of Finance as an example of market manipulation, it show how one can etch oneself into the way that Google resolves your queries- by using a popular blog to link to you in a certain context, and by routing many of its readers along for the collective experience of you. Soros explains the reflexivity of markets: the way one perceives a market can in fact impact the behavior of the market. He made billions off of this insight. The reflexivity of Attention markets is similarly based on the premise that one's perception of Attention influences its supply. Before dismissing the sethbrecht as a random blog divet, maybe theater is a useful metaphor for understanding the evolution from API to Alchemy. As you know, I have been trying to negotiate the transition for a number of months. I was focused on tracing the pure conversion of our automatic data algorithms into Attention streams, but I was having a difficult time describing how our unique streams collide- other than simply calling it Alchemy. This experience of being on stage, and using the stage as a means of changing user behavior, is something that is personal to me. I remember when I was 14 years old performing on the stage at the American Repertory Theatre in Cambridge, Mass. It was a bitter February evening during the week and I was standing on the stage dressed like an Italian kid fresh off of Ellis Island, with stiff-heeled shoes, an annoying beret and lots of make-up. The play was Pirandello's Six Characters in Search of an Author, adapted by Robert Brustein. I was standing on stage behind my mother, played by sitcom Alice's Linda Lavin, looking out at the audience, watching them watch me. On the stage behind me was most of the actual ART resident acting group, behaving as if they were in the midst of rehearsals for Gozzi's King Stag, which was in fact being directed then by Andrei Serban. They started the performance all smiles and inside jokes until the door at the back of the theatre opened up and so appeared a family of actors, including me as the youngest son, searching for our author ("any author will do...") who might finish our play. By gradually eliminating whatever proved superfluous, we found that theatre can exist without make-up, without autonomic costume and scenography, without a separate performance area (stage), without lighting and sound effects, etc. It cannot exist without the spectator relationship of perceptual, direct, communion…. This "relationship of perceptual, direct, communion" is very close to what I am trying to express with the notion of the readerverse- a place or moment where the reader and writer are both fully engaged in the cooperative process of creating something original (ie Alchemy) by virtue of the unique, real-time data streams that they surface to eachother. For a while I struggled to come up with a real-world object that best emblematized the readerverse: a mirror? a shadow? a trail we leave behind? But now I am fairly sure that the readerverse is best expressed as a stage, where we create social media with a sequence of clicks and tags and queries.